Students will learn basic music theory in conjunction with practice chanter movements, the history of noted pipers in the piping world, the scale, doublings, and G-D-E notes. Students will learn basic music theory, writing time signatures, writing embellishments, all doublings, grips, taorluaths, birls, and tac-cums. Students also learn to play three tunes (6/8, 2/4, and 4/4). Students will learn to read music accurately, learn 12 four-part tunes, begin playing on the pipes, and learn to march while playing the pipes. Students will learn to sight read simple tunes, learn to play taorluath, taorluath a mach, crunluath, crunluath a mach, darodo, and hibaba. Students also learn to tune and “set-up” pipes, bagpipe maintenance, proper Highland dress, the correct identification of ten official tartans. Beginning piobaireachd. Students will learn to write piobaireachd, play the movements and phrasing. 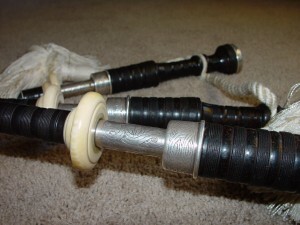 Students will learn to read and fine tune the pipes, compose music for the bagpipes, learn four ceol mors, the historical background of piping, famous composers and champion pipers, main international events, and correct identification of fifteen official tartans. Student will learn six piobaireachds, and write seven tunes. The bagpipe as a classical instrument, learn eight piobaireachds, history of noted players. Students will learn the background of the bagpipes and pipe bands.